I'm mainly bumping your topic (which is an interesting idea, to be sure) but I suspect you've got to have A LOT of volume to get an atmosphere to stick around. As in, Mars can barely do that, so you'd need to be thinking of a structure over half the size of the Earth. Sounds more steam punkish than science fiction. The best case scenario I see is to create a lattice work of ships in some kind of improvised Dyson sphere instead of making a quasiplanet with ships all the way to the artificial core. Still, the amount of ships used to build even a tiny dwarf planet or a moon like satellite is difficult to conceive. Remember, enough gravity crushes things on the inside. The core of most decent sized planets is molten metal just because of the gravitational force. That same gravity is what holds atmosphere in place, so even if you start with a bunch of interconnected ships, by the time you got to a mass sufficient to hold any decent atmosphere in place, you would have crushed most of the ships into molten metal at the core. My main thought was to use a ships artificial gravity and no open decks. If we can put people on the International Space Station (The dimensions of the completed ISS research facility will be approximately 356 feet (109 meters) by 240 feet (73 meters), or slightly larger than a football field. When completed, the ISS will weigh around 450 tons (408,000 kg), or 450 times the weight of an average car.) why not combine a bunch of ships by internal passages then spin the entire combined structure to create an artificial gravity? 1. The ships already have gravity. They attract each other. You don't need to do anything to "make gravity". Gravity is a attribute of all matter (and ships are made out of matter). 2. If the ships are massive and dense enough to have enough gravity to hold an atmosphere, the ships would almost certainly be crushed (perhaps by their own gravity). 3. You might want to read about Dyson spheres. They have figured into more than a few science fiction stories (e.g. the Bobiverse series... which is awfully fun to read). If such a conglomeration was being designed, you've come up with perhaps the least energy efficient way to go about it. Each of those ships you are imagining as necessary to build up sufficient gravity to bind them together as a sort of planetoid would have to be designed and constructed costing endless amounts of materials, labor and money. So that doesn't seem very realistic or likely. Much better if you were to suppose that the great mass of this thing was made up of naturally existing mass (asteroids, say) and simply moved to a location. You clearly wish that the ships are connected but that wouldn't have to be via each ship's interlocking doors. Some other means (some sort of tubing, perhaps) would do the trick and leave much needed room for the natural mass you've brought in for gravity/ballast. Another fine point (from a former Physics teacher... I can't help it). Spinning creates an outward force... away from the center of the "fake planet". When this technique is used to simulate gravity, the people are walking on the inside of the outside wall of the space station (with their heads facing toward the center). This is opposite from a planet, where the gravity pulls toward the center and the people's head (generally) face away from the center. I merely wondering the possibilities, no matter how outlandish it sounds. I just need the potential problems or possibilities. I was just looking up the calculations on how much gravity is needed to hold an atmosphere. By the way... spinning makes it more likely that the atmosphere will escape. It is not an easy calculation. The basic math is that the RMS value for velocity of a molecule in the atmosphere has to be lower than the escape velocity (given the mass of the structure and the temperature of the atmosphere). This little question has sparked my curiosity. I haven't done all the math yet, but I am pretty sure that you are going to need to crush the space ships (meaning that the interior can't be used). A recent Sci-Fi adventure movie called Valerian and the city of 1000 planets, featured a giant ball of ships which accumulated over centuries forming a type of space station. However, even that didn't have enough mass to hold things together by gravity, all the ships were just latched onto each other. There are a lot more efficient structures that can be built in space to achieve a low materials to surface area ratio. And with spin you can give it a fake gravity. The "Ringworld" type designs come to mind as some of the most efficient. For a more low-cost and robust type of solution to space habitation, I favor hollowing out asteroids. You get a relatively protected environment and you can use the asteroid for raw materials, so you don't need to ship them in. You can also do it just as a byproduct of the mining process itself. It's a "two (or three) birds with one stone" type of situation. I think a better approach would be to have a barren planet that has attracted millions of ships over the years and become a colony. Venus is a good example. Earthlike gravity, but the surface is unusable. Thanks much for the idea! As Roswell has already mentioned, there is the ring world concept from Larry Niven's 1970 novel. It could be constructed from the technology we already have, but it would be material intensive. In our star system, such a structure could be constructed from the "asteroids" in our asteroid belt. 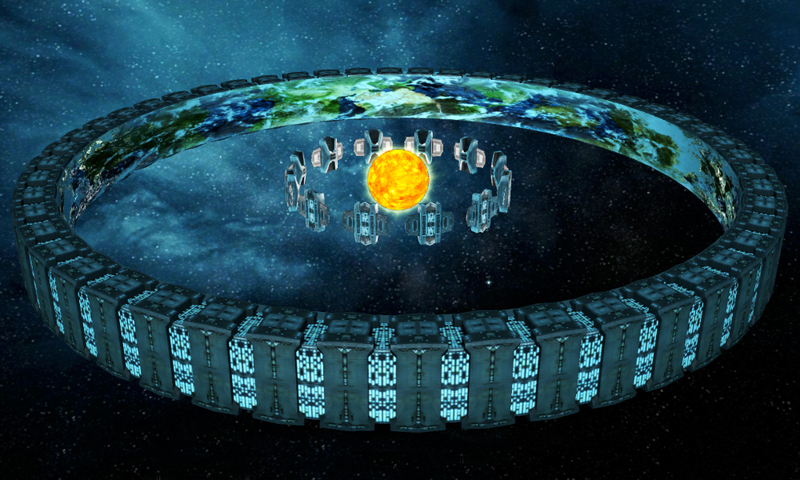 You can read about the Ringworld series of novels by clicking here. There is, however, a good reason why this is a subject of fiction. In the real universe, where are you going to come up with the funds, and who would ordain and oversee the construction and the maintenance? It has been proposed that such a structure could be built in a ring around a star, to harvest the energy output of the star. I make my living in resource development. The biggest reason that resources are a big business is that they dont disappear offn the planet. Till now. I'm not sure about the topic, but I am sure you missed it. I don't know Star Wars hardly at all. I'm more looking for a ramshackle community. What? This doesn't apply to any of my posts.